THE Gympie Times tallied 11 losses of life this year on Gympie region roads that include a spate of deaths from Bruce Highway horror crashes on the northern reach of the region. The highway tragedies north of Gympie included a horrific Easter Monday smash at Tiaro that instantly killed a Bundaberg brother and sister, a truck crash that took the life of a Brisbane father and his two young children and a crash outside the Gunalda service station that killed an elderly woman alongside her dog. The six deaths, occurring within weeks of each other in March and April and falling in the Maryborough police patrol, sparked an outcry for Bruce Highway road improvements to the north. In the aftermath, Wide Bay MP Llew O'Brien pleaded with his government to direct funding to the highway. He said the entire Bruce Highway needed to finally be upgraded to four lanes, with a barrier erected between north and south-bound traffic to prevent more head-on collisions. "Things can still go wrong with no barrier,” he said. Yesterday, Gympie's Sgt Rod Venn agreed that single-lane highways were to blame for a large portion of the road toll and said improvements to Gympie specific road crashes were due to highway upgrades to the south. "The area that we patrol has reduced in traffic crashes,” he said. "There's been no serious accident since the new highway was upgraded. He said enhanced intelligent enforcement had also seen fatality numbers diminish. When you got behind the wheel it was important to remember the impact your driving could have on your life and other people, he said. 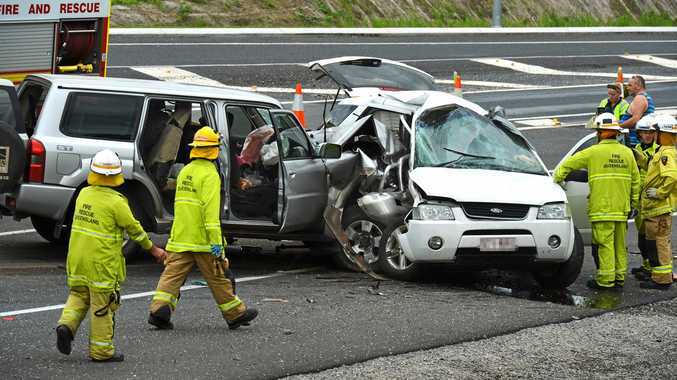 Year in review: 11 people die on Gympie region roads. A WOMAN who was hit by a truck on the Bruce Hwy north of Gympie later died in hospital. The 27-year-old Emerald woman had been walking on the highway at Chatsworth when she was struck by a B-double just before 9.55pm in the northbound lanes. She sustained multiple serious trauma injuries, including injuries to the head. Paramedics rushed the woman to Gympie Hospital before she was airlifted to the Royal Brisbane and Women's Hospital in a critical condition, but she died yesterday afternoon. The truck driver was treated for shock. A 40-year-old woman was killed in a crash in Gympie when the car she was driving smashed into a pole and parked car on Nash Street just after 8am. It's believed the woman suffered a medical condition, and it may have contributed to the accident. ONE person died after their blue dual cab ute rolled on the Rainbow Beach Rd. The crash occurred on a windy section of the road 3km west of Queen Elizabeth Dr about 2pm. The vehicle came to rest on its side in heavy bushland at the side of the road. A BABY girl became the third victim of a horror crash that killed a father and his two children north of Gympie that witnesses described as complete devastation when a car collided with a truck, rolled down an embankment and burst into flames. The one-year-old was freed from the mangled wreckage of the collision on the Bruce Highway near Gunalda close to Gympie on Sunday morning. She was flown to Lady Cilento Children's Hospital in Brisbane in a critical condition, but died from her injuries early the next morning. She was the third person to die in the head on crash which happened when a car travelling north collided with a southbound truck around 11.20am. The 42-year-old driver and a nine-year-old boy who was also in the car died at the scene. Police have said fatigue may have played a part in the fatal crash. AN ELDERLEY woman was killed alongside her dog and another person was critically injured after a horror two-car crash on the Bruce Hwy near Curra. The 75-year-old was pronounced dead at the scene after a car exiting the United Service Station near Gunalda on the Bruce Hwy collided with another vehicle travelling north along the Bruce Highway. A Queensland Ambulance service spokeswoman said four other people were treated on the scene. In a separate incident amid the chaotic scenes, another man was spoken to by police in relation to his behaviour at the scene. A semi-trailer who had also pulled into the station attempted to leave before hitting a garden bed, and then allegedly reversing into another car queued behind him. The highway took almost fours hours to open. TRAGEDY struck on Easter Monday when Brisbane siblings Sarah and Daniel Walker were killed at Tiaro. The siblings were killed in the three-car head-on collision just north of Tiaro while travelling along the highway. The group had visited their hometown Bundaberg for a family Easter celebration, and were on the return trip to Brisbane when they were struck by another car. The crash left four others with serious injuries. IN MAY, a former police officer lost his life on Netherby Rd near Tiaro. Kevin Guteridge served communities across Queensland in the decades he worked as a police officer. The 86-year-old was remembered as a loving family man and a legend within the Queensland Police Service for his community engagement. His wife, Cynthia, survived the crash. The crash happened as two people in a Toyota Landcruiser were towing a caravan southwards towards Gundiah and the Hervey Bay couple was in a small sedan heading north towards Tiaro. The two vehicles came into collision on a straight road in fine conditions. Although the sealed area of the road was relatively wide, deep drains on either side left little room to manoeuvre. GYMPIE police believe the rider, a 33-year-old man from Black Mountain, was travelling east on Gap Rd at Cedar Pocket, via Gympie when he lost control of his Yamaha motorcycle. A Queensland Police Service spokeswoman said the man was pronounced dead at the scene. A 64-year-old Veteran woman died following a serious crash in Veteran. The vehicle was reportedly travelling on Belvedere Road at 12.10pm when it left the road and crashed through a fence and into a tree. The female driver, and sole occupant of the car, was taken to hospital with serious injuries where she later died.